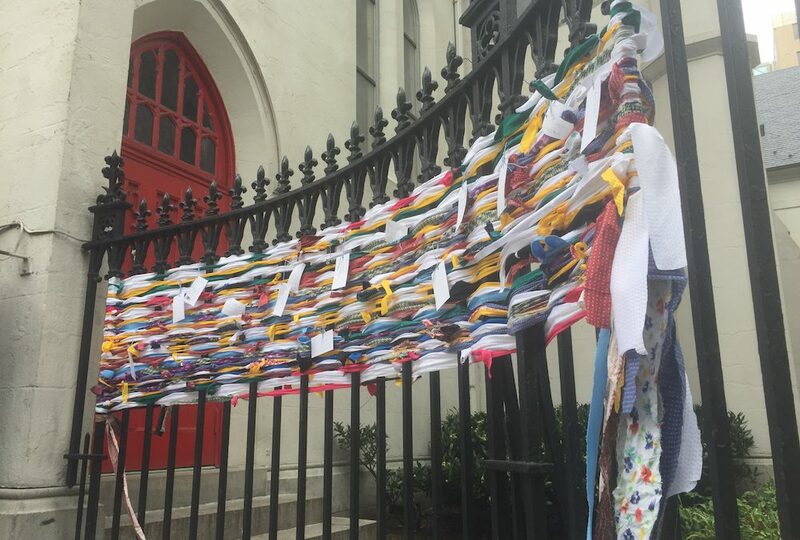 WASHINGTON — The fence in front of downtown Washington’s Church of the Epiphany became a work of art Wednesday, covered in strips of fabric by passersby as part of an effort to help those who have a home think about those who don’t. Organizers of the art project— #OurCommonThreads on Twitter and Instagram— provided passersby with strips of fabric to weave into the fence of the church’s courtyard, creating a large, bright, temporary tapestry. Some weavers also hung cards with messages on the fence. The public art project is part national Hunger and Homelessness Awareness Week, in which hundreds of organizations hold education, fundraising and community events to highlight the pervasive problem of homelessness. The D.C. art project was the brainchild of Kelsey Timpone, 21, an intern with Street Sense Media, an organization that publishes a newspaper sold by homeless people that is headquartered in the Episcopal church. Timpone is working on a master’s degree in art and teaching at George Washington University. “We hope everyone who participates upholds the commitment they’ve made to being part of the solution to end homelessness,” she said. The tapestry will remain on the fence at the Church of the Epiphany through Nov.18, when Hunger and Homelessness Awareness Week ends. Selling the newspaper is a way to provide “low barrier” employment for people who may not have an ID or birth certificate, according to Leila Drici, 29, Street Sense Media’s events and workshops coordinator. All Street Sense vendors participate in a training program that teaches topics including how to build a business, create a client base, and where it is permitted to sell newspapers. Each vendor receives a brightly colored name badge with a photo and lanyard. Because many people no longer carry cash, there is a “Street Sense Media” app that can be downloaded from the app store. The app lists each vendor by name and photo. Street Sense Media also provides workshops for their vendors, including experimental art, writing and photography. There are weekly film screenings with free popcorn and a field trip to the National Portrait Gallery to view a Gordon Parks photography exhibit is also in the works. The church also works with case workers and social workers who help homeless people find housing. Robert Warren, 56, is a formerly homeless person who continues to be an advocate with the National Coalition of the Homeless. “Anybody can be made homeless through hurricanes, wildfires,” he said. There are approximately 553,742 people experiencing homelessness, although an accurate count is difficult because the homeless have no fixed address or, often, phone. Approximately two-thirds live in shelters, and one-third live on streets, under bridges, in abandoned buildings, in cars- or anyplace else they can find. The National Alliance to End Homelessness creates the national report on homelessness by picking one date and doing the national count then to avoid double-counting. In Washington, the Metropolitan Council of Governments released the 2018 report in May. There were 6,904 homeless people, a decrease of 569 people.